Upper VS Lower Antelope Canyon? 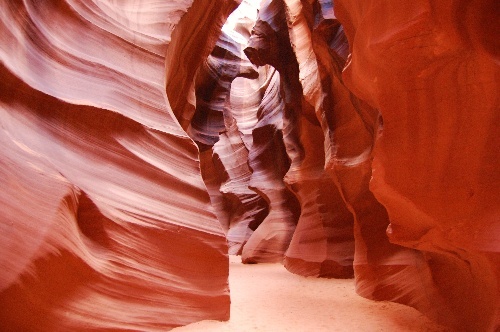 More and more people go to the Antelope Canyon National Park in Califonia for travleing and photoes nowdays. But most of them don't have time to do both Upper and Lower Canyon trip. I'd like to share my experience with you about the difference between Upper VS Lower Antelope Canyon. I ever made a reservation for the photography tour with Chief Tsossie for Upper, but then I read a comment on a photography site that this tour didn't have any fewer people than the regular tours. So I started looking into Lower. We don't have any physical impediments. We're not great athletes, but we can handle walking a few kms and climbing the ladders seems like more fun. And Lower seems to be cheaper, too. So why is the Upper so much more popular? Would we be missing out doing Lower? I visited in the morning (around 9am) in December 2016 and my review is based on the lighting during that time in the canyon. I prefer the Lower Antelope Canyon. It's beautiful and easier walk-through. It was quite dark in there so only professional cameras can capture nice photos. It's much brighter inside the Lower Antelope Canyon. Depending on how the sunlight comes in the crack, you may or may not see the "orange" tone of the stones. I didn't see much of the orange stone, I saw mostly gray because it was too dark. Much easier to catch the beautiful colours on the stone at Lower Antelope Canyon. One way in, same way out. It's basically a 2-way traffic. So getting photos is hard and you don't get much time to enjoy the scenery. The Lower Antelope Canyon is a 1-way traffic so it's a bit better.